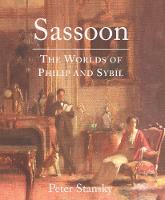 Sir Philip Sassoon (1888–1939), a glamorous and well-known figure in Britain for the first four decades of the twentieth century, was the most eligible bachelor and the greatest host of his time. He attained prominence in the art world, high society, and politics. In contrast, his sister Sybil (1894–1989) lived a much more private life. Yet she was fascinating in her own right, marrying into the grandest level of the English aristocracy, restoring Houghton—formerly the house of Sir Robert Walpole—to magnificence, and serving in the high command of the Women’s Royal Naval Service during both world wars. In this generously illustrated book, distinguished historian Peter Stansky brings the Sassoons and their period into sharp focus. He also explores what their lives reveal about the nature of English life, particularly at the highest reaches, and its relation to wealth, power, politics, Jewishness, and art.